Anne-Marie Slaughter landed her dream job as the director of policy planning at the U.S. State Department under Hillary Clinton. She served in this role for two years as she took time away from her career as a professor at Princeton. In 2011, she took resigned from the State Department to return home and bring balance back to her life. Slaughter brings together a collection her past experiences, media and literary sources to bring forward her thoughts, beliefs and hopes to guide us to improved equality in the workforce for all people - not just women. Being a mother of two young children with a demanding career has often left me looking to books and articles online to help my husband and I along the way. Many of these provide some of the same basic tips which rarely ever worked for our family's situation. Thankfully, the wonderful folks at Random House Canada came to the rescue with an ARC of this gem. 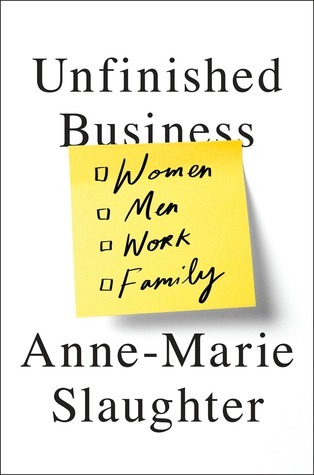 Unfinished Business is the best work-life balance book I've read, EVER. Slaughter provides clear and concise examples for all people in various stages of their lives. There is a chapter and set of actionable steps for everyone. Her learnings from her own family life, books/articles she's read and those around her are compiled into this book for all to see. I would recommend this book in a heart beat to anyone no matter what stage of you're life you're in. Whether you have kids or not will not make a difference when reading this book. For single folk and young couples, it can help you start off your careers with an open mind, and for young families in similar situations to mine, it will remind you that you're not alone. Anne-Marie Slaughter hit a home run with this book! If anyone else has read it, I'd love to hear your thoughts, feel free to leave them in the comments box below.